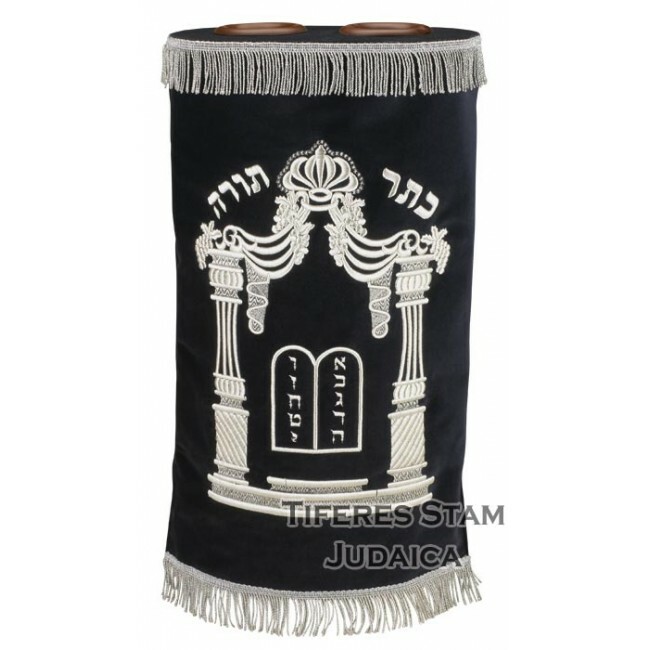 This magnificent Sefer Torah Cover is produced from top quality velvets and threads. The stunning machine embroidered design features the Decalogue enclosed in an arch formed from two detailed pillars and an elaborate crown. The crown symbolizes the 'crown of Torah' that every Jew wishes to acquire. 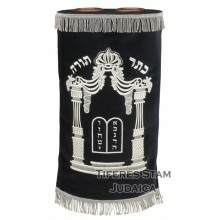 The brilliant silver threads against the rich black velvet helps create the regal appearance of this Torah Mantle. Sefer Torah Mantles are fashioned with open or closed backs, with or without fringes. All our Torah mantles are finished with reinforcement rings to guarantee many years of long lasting use. All our Sefer Torah Mantle creations can be customized with Hebrew and English embroidered inscriptions. Our Collection of Sefer Torah Mantles are fashioned by the most gifted and talented craftsmen on select velvets and velours. Only the finest silk and metallic lurex threads are used for our exclusive Synagogue Embroidery.